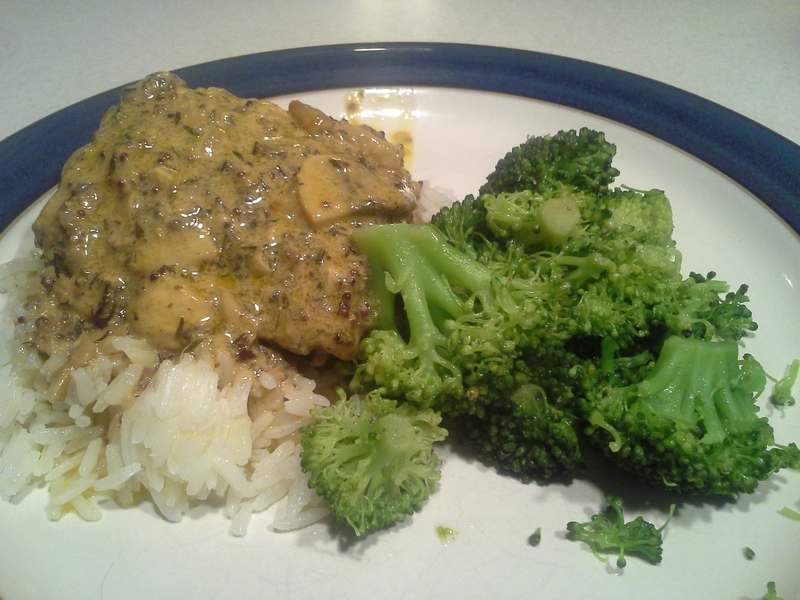 John wanted sort of a French mustard, thyme sauce. To go with it, he steamed some broccoli and fixed some rice. The sauce is savory, so the bitter broccoli went well with it. Fry them with the skin down for a little while to get them brown. Put them in a 425 degree oven for about a half hour in a roasting pan. Take chicken out. Put roasting pan on the stove top, added some cream (about a 3/4 or a cup? ), added some mushrooms (about 12, sliced), added a little bit more thyme, a little bit more white wine, and now he’s reducing it. It’s the bits from the roasting pan that make it great. It’s deglazing. He let it sit on simmer for a while (at least a half hour) while the kids went to bed. It can simmer as long as you want. Put the chicken back into this.